In a medium saucepan, cover the potatoes and carrots with cold water. Bring to a boil over high heat, then simmer over moderately low heat until the carrots are tender, about 10 minutes. Using tongs, transfer the carrots to a plate to cool. Continue to simmer the potatoes until tender, about 20 minutes longer; add the peas for the last 30 seconds of cooking. Drain and let the potatoes stand until cool enough to handle, about 10 minutes. Cut the potatoes and carrots into 1-inch pieces. Meanwhile, in another medium saucepan, cover 4 of the eggs with cold water and bring to a boil. Cover the saucepan, remove from the heat and let stand for 8 minutes. Drain and cool the eggs under cold running water. Peel the eggs, then cut them into bite-size pieces. In a large bowl, using a hand mixer, beat the remaining egg with 1 tablespoon of the olive oil, the lemon juice and 1/2 teaspoon of salt until combined. Slowly beat in the remaining 7 tablespoons of olive oil at high speed until emulsified. Gently stir in the potatoes, carrots and peas and season with salt. Fold in the tuna and the chopped eggs. Transfer the salad to a serving dish. 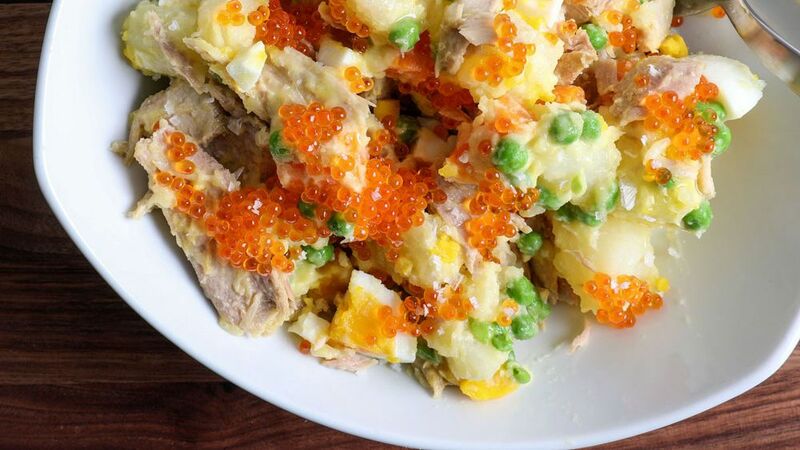 Drizzle with olive oil, top with the trout roe and serve.